Enjoy this two minute flight through the universe animation, which includes close to 400,000 galaxies, and the accompanying first public release of data from the Baryon Oscillation Spectroscopic Survey. This animated flight through the universe was made by Miguel Aragon of Johns Hopkins University with Mark Subbarao of the Adler Planetarium and Alex Szalay of Johns Hopkins. There are close to 400,000 galaxies in the animation, with images of the actual galaxies in these positions (or in some cases their near cousins in type) derived from the Sloan Digital Sky Survey (SDSS) Data Release 7. Vast as this slice of the universe seems, its most distant reach is to redshift 0.1, corresponding to roughly 1.3 billion light years from Earth. SDSS Data Release 9 from the Baryon Oscillation Spectroscopic Survey (BOSS), led by Berkeley Lab scientists, includes spectroscopic data for well over half a million galaxies at redshifts up to 0.8 — roughly 7 billion light years distant — and over a hundred thousand quasars to redshift 3.0 and beyond. BOSS is capturing accurate spectra for millions of astronomical objects by using 2,000 plug plates that are placed at the Sloan Foundation Telescope’s focal plane. 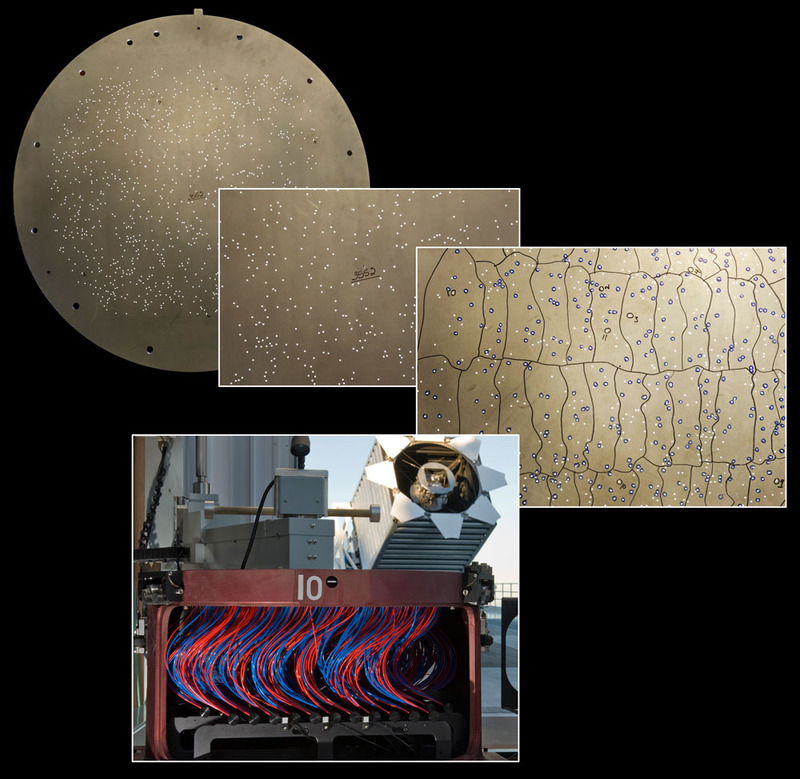 Each of the 1,000 holes drilled in a single plug plate captures the light from a specific galaxy, quasar, or other target, and conveys its light to a sensitive spectrograph through an optical fiber. The plates are marked to indicate which holes belong to which bundles of the thousand optical fibers that carry the object’s light. The Third Sloan Digital Sky Survey (SDSS-III) has issued Data Release 9 (DR9), the first public release of data from the Baryon Oscillation Spectroscopic Survey (BOSS). In this release BOSS, the largest of SDSS-III’s four surveys, provides spectra for 535,995 newly observed galaxies, 102,100 quasars, and 116,474 stars, plus new information about objects in previous Sloan surveys (SDSS-I and II). Spectroscopy yields a wealth of information about astronomical objects including their motion (called redshift and written “z”), their composition, and sometimes also the density of the gas and other material that lies between them and observers on Earth. The BOSS spectra are now freely available at http://sdss3.org to a public that includes amateur astronomers, astronomy professionals who are not members of the SDSS-III collaboration, and high-school science teachers and their students. The new release lists spectra for galaxies with redshifts up to z = 0.8 (roughly 7 billion light years away) and quasars with redshifts between z = 2.1 and 3.5 (from 10 to 11.5 billion light years away). When BOSS is complete it will have measured 1.5 million galaxies and at least 150,000 quasars, as well as many thousands of stars and other “ancillary” objects for scientific projects other than BOSS’s main goal. BOSS is designed to measure baryon acoustic oscillation (BAO), the large-scale clustering of matter in the universe. BAO began as rippling fluctuations (“sound waves”) in the hot, dense soup of matter and radiation that made up the early universe. As the universe expanded it cooled. Finally atoms formed and radiation went its own way; the density ripples left their marks as temperature variations in the cosmic microwave background (CMB), where they can be detected today. The CMB came into being 380,000 years after the big bang, over 13.6 billion years ago, and continues to stretch across the entire sky as the universe expands. Peaks in CMB temperature variation occur about half a billion light years apart, at the same angle, viewed from Earth, as peaks in the large-scale galactic structure that evolved billions of years later. The regions of higher density in the CMB were in fact the sources of galaxy formation; they correspond to regions where galaxies cluster, along with intergalactic gas and concentrations of much more massive underlying dark matter. The natural “standard ruler” marking peaks in clustering can be applied not only across the sky but in all three dimensions, backward in time to the CMB. Distant quasars provide another way of measuring BAO and the distribution of matter in the universe. Quasars are the brightest objects in the distant universe, whose spectra bristle with individually shifted absorption lines, a “Lyman-alpha forest” unique to each that reveals the clumping of intergalactic gas and underlying dark matter between the quasar and Earth. Schlegel has called BAO “an inconveniently sized ruler,” requiring “a huge volume of the universe just to fit the ruler inside,” but it’s a precision tool for tracking the universe’s expansion history, and for probing the nature of gravity and the mysterious dark energy that’s causing expansion to accelerate. To fill the huge volume, BOSS had to find more and fainter objects in the sky at greater distances than SDSS had attempted before. The camera system and spectrographs of the 2.5-meter Sloan Foundation Telescope at the Apache Point Observatory in New Mexico had to be completely rebuilt. SDSS uses “plug plates” at the telescope’s focal plane, aluminum disks with holes drilled to match the precise position of previously imaged target objects. SDSS-I and II plug plates had only 640 holes apiece, each covering three arcseconds; BOSS is using 2,000 plug plates with 1,000 holes apiece, each covering a tight two arcseconds to reduce light that’s not from the target. Optical fibers are plugged into the holes every day by hand, to guide the light from each target to a spectrograph. While weather conditions vary night to night, observations on the best nights use up to nine plug plates. For BOSS, the spectrographs were rebuilt with new optics and new CCD detectors designed and fabricated at Berkeley Lab. Working with Schlegel and Adam Bolton at the University of Utah, Berkeley Lab’s Stephen Bailey is in charge of daily “extraction pipeline” operations that convert raw data from the telescope into useful spectra and quantities derived from them, ready for scientific analysis. Data storage and the extraction pipeline run on the Riemann Linux cluster of Berkeley Lab’s High-Performance Computing Services Group; the data is copied from Riemann to the University of Utah, New York University, Johns Hopkins University, and the National Energy Research Scientific Computing Center (NERSC) at Berkeley Lab. The Lab also hosts the SDSS-III website, http://sdss3.org, from which the data can be downloaded. Be the first to comment on "Animated Flight through the Universe & First Public Data Release from BOSS"